Another late night reading; another brilliant book as my admiration for Mark Lawrence’s writing continues unabated. 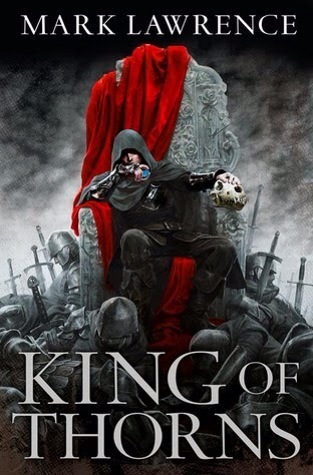 Book Two in the Broken Empire series brings more of everything that was so good about the first novel. More Makin, Rike and the other band of brothers, more monsters from the deep, more insight into the race of Builders, more mayhem and battle and more of Jorg and his quick witted, innate intelligence. Told in three looping narratives by Jorg, all circling around the same inevitable conclusion, we are treated to a number of views about the boy-warrior turned King. Reaching back to where Prince of Thorns ended, four years previous, these flash backs flesh out all that is needed to tell the tale of Jorg’s current situation; a battle with Orrin, Prince of Arrow and the prophesied Emperor who will reunite the Empire. Interlaced with these is the story of a box. A box into which a Mage has trapped Jorg’s memories. As the story builds and Jorg rediscovers what he has sealed away, the author shows us just how much that violent, psychotic boy has changed but also what he has lost. The interplay between his present and the looming battle with the past and all his travels is a wonderful insight into the character and the world he inhabits. Lawrence uncovers more of the Builders with subtle touches as the mystery of the setting unfolds. The novel is a brilliantly crafted piece of writing. All the pieces fall into place as Jorg shows his cunning and determination, once again beating the odds whilst simultaneously finding that old fierce and destructive power that earned him his reputation as a boy. The conclusion is explosive, rending a hole through the fantastical and shedding a new light on to the world of the Broken Empire. In the end it is Jorg’s pride, his iron clad will, that makes him such a forceful power. As a boy he killed a king; as a young man he destroyed a prophecy. What Lawrence has planned in the last book of the trilogy I cannot wait to discover. The holiday reading continues, this time with another author I’ve been shamelessly waiting to complete a trilogy before starting. Much has clearly been written about Mark Lawrence’s work and, now, having torn through Prince of Thorns in just two nights, I can see why. Firstly, let me just say that Mark Lawrence is a fantastic writer but he is clearly some kind of super human for the fact that he can manage four kids, a job that obviously requires some pretty huge brain power, a number of interesting hobbies as well as writing top notch novels. The awe and envy I feel are untold. On to the novel, however. 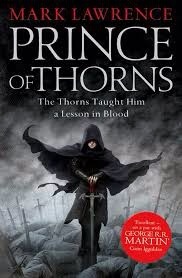 Prince of Thorns is brilliant in my opinion, plain and simple. The writing is so consumable it takes an effort of will to put the book down. The story is gripping and the way the backstory is woven in amongst the action, bringing reason to the carnage but not excuses, is skilfully done. Following Jorg Ancrath, born a Prince but now a leader of a rag-tag band of thieves and mercenaries, we are introduced to a world at once medieval yet strangely not. Jorg and his band of brothers are on a murderous, meandering path when we first meet them but as the story unfolds, the boy-warrior with an evil temper rediscovers his direction and sets to his work with a relentless determination. There’s much talk of the game, as though life and death where a chess board. It is an apt metaphor. Jorg is all about the long game and not worried about making sacrifices, even though they are the lives of his road brothers. His is a war of vengeance; one of attrition for he has already lost all that matters to him. It is the thing that has shaped him into this Prince of Thorns. Whilst the action is brutal at times, Jorg is a hugely engaging character. There’s a lot to empathise with and much to fear. But, though Jorg is the main point of view in the book, it is the brilliant cast of supporting actors and the subtle yet wonderful setting that really made the whole novel for me, enticing me sit up most of the night and read and read. Lawrence is a masterful story teller and, clearly, a fantastically creative mind. Now, I’m off to read the next instalment. It’s that good. I haven’t read an author back to back for a long while and it makes me feel like a kid on my summer holidays as I delve further into Neal Asher’s Polity novels. Becoming absorbed in a writer’s universe is a wonderful thing when you have the time to do it (although the ‘holiday diet’ is coming to an end as training has recommenced). 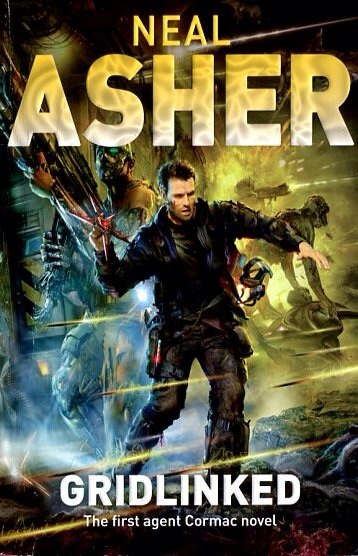 The Line of Polity reunites us with Agent Ian Cormac as well as a number of other characters from Asher’s debut. Fleshing them out and giving them more of the stage, we come to understand and see a little more of the universe that Asher has created, offering a contrast against which we can consider agent Cormac. The novel introduces another, more sophisticated yet still psychotic villain as well. It is in pursuit of this mad scientist, Skellor, that we find Cormac working with Gant, a former Sparkind and now a memplanted Golem, and Scar, one of Dragon’s creations. If that isn’t enough to unpack, Thorn, another Sparkind, is working undercover against the Separatists on a different planet when he encounters and is saved by John Stanton, a mercenary turned good guy. These two story lines quickly intertwine to place both groups on the strange world of Masada; a bizzare place run by religious zealots and peopled by enslaved humans and all manner of weird and deadly creatures. Escaping from Cormac, Skellor uses an ancient technology, combining it with an AI to subvert a Polity dreadnought ship. In amongst all this, part of Dragon decides to help Cormac as the theocracy on Masada have used it as a scape goat. The ensuing melee is remarkable and Asher keeps a head of steam going as all the elements drop into place for a final, all out battle on the planet that is as relentless and bloody as they come. Clearly having fun with his characters, Asher has a distinctive style when it comes to his villains. The satisfaction of seeing them vanquished in no way diminished by their clearly defined place. However, a number of other actors do inhabit a grey area, especially Stanton whilst Cormac’s own ruthless and strict action may place him as cold and calculating, his heart is always in the right place. From the brilliantly twisted creations of the Gabbleduck and the Hooder to the frightening and nightmarish Skellor, The Line of Polity once agiain puts Asher’s creative abilities on show. The politics and intermingled weirdness of Masada is a great backdrop for the ensuing action packed story and the clever finale was a nice, succinct conclusion to a very readable book. My blogging activity has slowed somewhat these last few weeks due to some fairly massive life changes. However, a holiday is now on the menu and with that comes the need for some awesome reading (although suitcase space was at a premium so I was lucky to sneak in all the books I did). I’ve been wanting to read Neal Asher for a while as I’ve heard great things about his work. After reading up on his biography (cos I’m a geek who does that a lot with authors), I was even more intrigued. I decided to start with Gridlinked, the first Agent Cormac novel, and I’m pleased to report that I’m a happy camper. Check out the blurb below..
It’s not only humans that know the meaning of hate. A technician passing through the runcible on Samarkand at a fraction below light speed causes a fusion explosion that kills thousands and obliterates a terraforming project. Earth Central sends agent Cormac to investigate. First published in 2001, Gridlinked was Neal Asher’s debut and there is a lot to like about it. It’s a universe in which humanity has spread throughout the stars thanks to Skaidon technology and the runcibles, making instantaneous travel across light years possible. Mental and physical augmentation are common place, longevity of life is up to hundreds of years and AIs govern everything. Clearly Asher’s creativity is abundant as Gridlinked hints at so many interesting aspects from the Polity itself to the boosted and augmented humans that populate it. The novel begins with an accident that shouldn’t be possible and which is clearly suspicious. Enter stage right one very ruthless and logical agent Ian Cormac. One of Earth Central’s most prized agents, Cormac’s own journey not only requires him to solve the riddle of the exploding runcible and the alien intelligence behind it, as well as fending off the unrequited attention of a rebel leader and his psychotic pet of an android, but to also regain his own humanity. It’s an interesting journey from an emotionless operator to a semi-suave, whiskey drinking agent. Asher handles all the threads brilliantly as Cormac becomes more human, his stalker Arian Pelter becomes less so. All of this action is sandwiched between and entwined with the greater mystery of the ‘Dragon’ and his weird games. In the end, what we have is a hard sci-fi action thriller that, I feel, sits nicely alongside the likes of Ian M Banks and Richard K Morgan. It’s fast paced and action packed but with plenty of technical detail all wonderfully explained. Cormac is an intriguing character with a lot of scope and there is a host of enthralling details waiting to be explored. 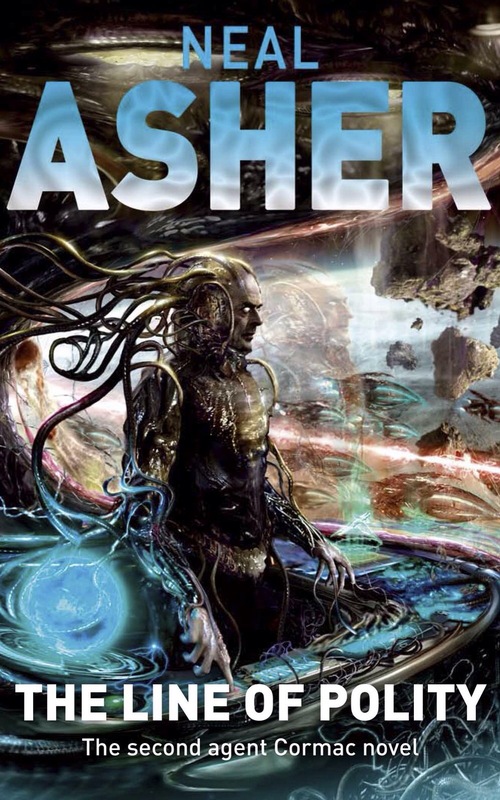 Asher has created a vast universe with his debut and I’m already set to start the next novel in the series. Happy camper indeed (although I must stress, I am not camping but instead am stuffing my face with my patented ‘holiday diet!). John Scalzi has an effortless ability to drop you into a world full of detail and wonder, peopled with larger-than-life, fully fledged characters. Lock In epitomises that skill. Following Chris Shane, FBI rookie and poster boy for Hayden’s disease (the illness the book is named for) and his partner Agent Vann (also afflicted by the disease but in a very different way), the story is a taut, action filled, crime thriller set in a brilliantly conceived future. Hayden’s is similar to meningitis but it’s effects are wildly different. For some, like Shane, the result is total body paralysis; being locked in. For others, a rare few like Vann, it changes their brains to allow them to be integrators for the former. Technology has taken a huge leap in advancements to help those locked in, meaning that they can use robots as vehicles for their minds. It’s an interesting concept, one which Scalzi takes to it’s logical conclusion: how would it be used for nefarious purposes. Shane and Vann are quickly embroiled in a complicated and puzzling case and the duo are soon pursuing rogue integrators, unlicensed ‘threeps’ (the real life robotic avatars) and wildly powerful businessmen. It’s a bizarre crime that begins the story but the journey to the brilliant ending is engrossing. As usual, Scalzi tackles some big topics with aplomb, even dropping in a few facts (gay marriage as just one example) with little ceremony. Scalzi’s latest is a fantastic read. A fast paced sci-fi crime thriller, Lock In has enough of both to keep fans of either genre gripped. 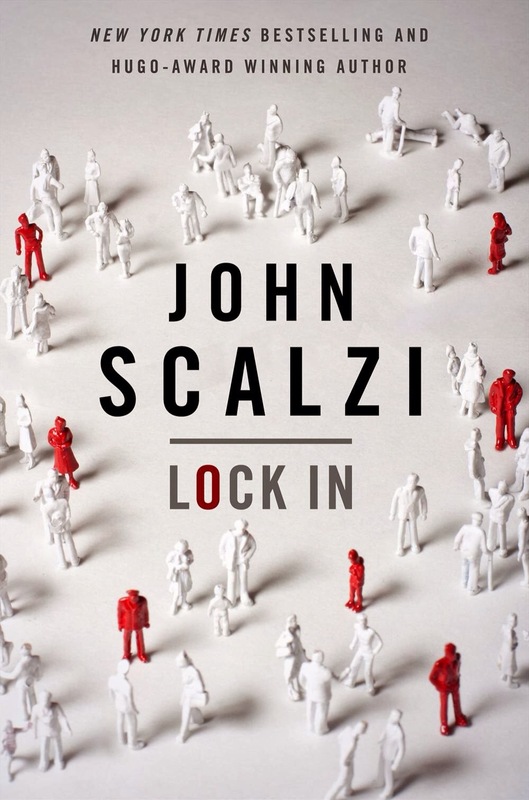 Another accomplished novel from John Scalzi and another recommendation from this reader.